MADRID -- Spanish health officials were investigating Wednesday whether a nursing assistant infected with Ebola got the deadly disease by touching her face with Ebola-tainted protective gloves, while a strike by Ebola burial teams in Sierra Leone left abandoned bodies in the streets of the capital. More than 3,400 people have been killed by the Ebola outbreak in West Africa, which has hit Sierra Leone, Guinea and Liberia hardest. The case of Spanish nursing assistant Teresa Romero has shown that health workers can contact Ebola even in highly sophisticated medical centers in Europe. In Madrid, Dr. German Ramirez of the Carlos III hospital said Romero remembers she once touched her face with the gloves after leaving the quarantine room where an Ebola victim was being treated. Health officials say Romero twice entered the room of Spanish missionary Manuel Garcia Viejo, who died of Ebola on Sept. 25 - once to change his diaper and again after he died to retrieve unspecified items. Ramirez said Romero believes she touched her face with the glove after her first entry. The Sierra Leone Broadcasting Corporation, meanwhile, reported that bodies of Ebola victims were being left in homes and on the streets of Freetown because of the strike by burial teams, who complained they had not been paid. The dead bodies of Ebola victims are highly contagious. In neighboring Liberia, health workers said they planned to strike if their demands for more money and safety equipment were not met by the end of the week. Speaking on radio Wednesday, Sierra Leone's deputy health minister Madina Rahman said the strike had been "resolved," though organizers could not immediately be reached to confirm it was over. "The health ministry is going to investigate the delay in the health workers not receiving their money," Rahman said. The burial teams make up a total of 600 workers organized in groups of 12, health ministry spokesman Sidie Yahya Tunis said. Tunis described the situation as "very embarrassing." The government was already facing criticism this week over a shipping container filled with medical gear and mattresses that has been held up at the port for more than a month. In Liberia, health workers are demanding monthly salaries of $700 as well as personal protective equipment, said George Williams, secretary-general of the National Health Workers Association. "We give the government up to the weekend to address all these or else we will stop work," Williams said. The average health worker salary is currently below $500. Finance Minister Amara Konneh has defended the compensation for health workers, saying last week that it was more than Sierra Leone and Guinea were offering. Health workers are especially vulnerable to Ebola, which is spread by contact with the bodily fluids of infected people. Liberia's United Nations peacekeeping mission said Wednesday that an international member of its medical team had contracted Ebola, the second member of the mission to come down with the disease. The first died on Sept. 25. The mission is identifying and isolating others who may have been exposed and reviewing procedures to mitigate risk, Karin Landgren, special representative of U.N. Secretary-General Ban Ki-moon, said in a statement. In Spain, Romero is the first person known to have caught the disease outside the outbreak zone in West Africa. She was said to be in stable condition Wednesday. In an interview published by Spain's El Mundo newspaper, the woman said she followed safety protocols as part of the team treating the priests. She said by telephone from quarantine she felt "better, a little bit better" since being hospitalized Monday. Her husband, Javier Limon, is also quarantined at the hospital. He identified his wife in a video he sent to Spain's Animal Rights Party pleading for people to support his drive to prevent Spanish authorities from euthanizing the couple's dog, a mixed breed named Excalibur. Limon told El Mundo by telephone that his wife went on vacation after Spanish missionary Manuel Garcia Viejo died at Carlos III. She started feeling sick with a low fever Sept. 30 but did go to a career advancement exam attended by other candidates, Limon said. Health authorities have said she did not leave the Madrid area during her vacation. Dozens of animal rights activists outside the couple's apartment complex Wednesday morning scuffled with police, trying to prevent an ambulance and workers in white hazmat suits from entering to disinfect the couple's apartment and take away Excalibur. Madrid regional's government obtained a court order Tuesday to euthanize the dog, saying "available scientific information" cannot rule out the possibility that Excalibur could spread the virus. 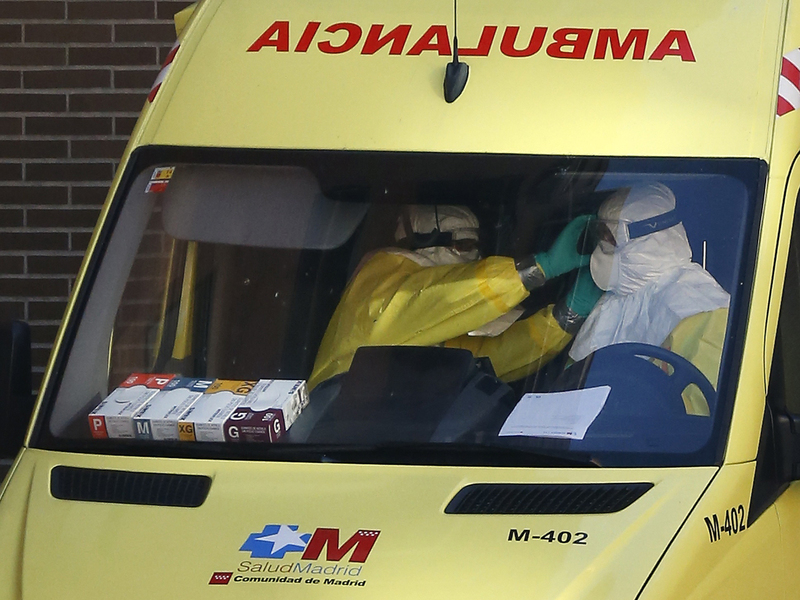 Two other people quarantined in Madrid, a nurse and a Spanish engineer who had traveled to Nigeria, were cleared Wednesday to check out of Carlos III hospital after testing negative for the Ebola.